The Embassy of the Federal Republic of Germany in Beijing was officially opened on 1 December 1972. As the chancellery building had not yet been completed the first German chargé d’affaires ad interim resided at the “Hotel of the Nationalities” in Beijing. Forty‑five years ago, China and Germany barely had any contact. For example, in the early years of their diplomatic relations, China hosted only three German students and Germany 10 Chinese. Today there are about 32,000 Chinese students in Germany and nearly 7,000 German students in China. From just a few hundred visits by people in the 1970s, yearly trips between the two countries have increased to more than 2 million with about 10 direct flights a day. In 2016, China became Germany’s most important trading partner, with bilateral trade reaching more than 170 billion euros. More than 8,200 German enterprises are operating in China with an investment volume of over 60 billion euros. 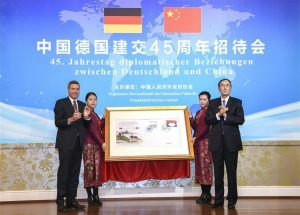 Following a Chinese tradition the Vice Chairman of the Standing Committee of China’s National People’s Congress and the German Ambassador to China on 14 November 2017 unveiled a commemorative envelope celebrating the 45th anniversary of the establishment of diplomatic relations between their countries.